People are probably wondering when the old ABC building in Perth will be cleaned up and made presentable. Veterans who worked there lament its deteriorated state since the ABC vacated, whilst youngsters with no sense of nostalgia most likely want it gone altogether. It looks like many heritage sites, such as the burnt out Guildford Hotel, which is experiencing demolition by neglect. Many abandoned buildings are found attacked by vandals, become home to vagrants, and are smashed and soiled in the process. Former staff, performers, guests and visitors will remember the many concert performances, radio plays, informative talks, women’s and children’s sessions, the highly popular evening music programs, with a different theme each night, and the dulcet tones of the announcing fraternity that accompanied each melody. But those tones would turn melancholiac if the radio pioneers could see the place now. Few realise what a remarkable building it is inside. It was built in an age when the consideration for the natural acoustics of a room played a very important role in its design. The Basil Kirke Studio was an excellent performance and recording venue with a world wide reputation. It was home to the Western Australian Symphony Orchestra for 45 years. Who performed there as the Western Australian Philharmonic Orchestra, on numerous movies and television scores, for the highly noted Hollywood music score mixer Mal Luker. The site has also a wealth of smaller studios, purpose built for chamber music, dramatic performances, and later on, the recording of rock groups and all manner of popular music. 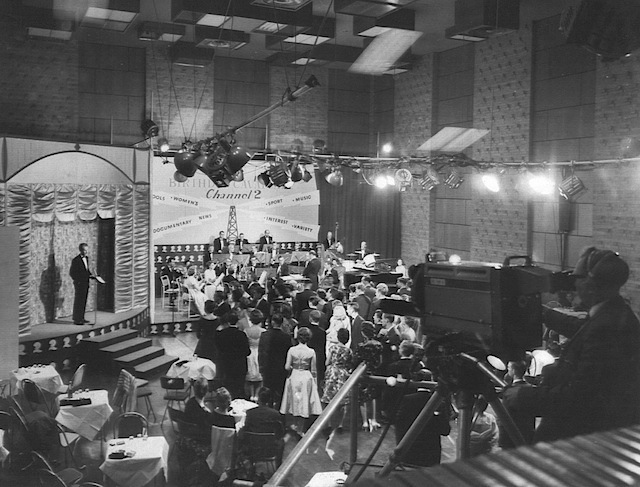 The Basil Kirke Studio was often the stage for many large local ABC television productions, the venue for numerous social functions and the tally room on election nights. For thirty-five years John Juan endeared himself to thousands of Western Australian ABC listeners who warmed to his sentimental signature tunes, There’ll be a Silver Lining, We’ll Meet Again and Up with the Curtain. His most popular programmes were ‘The Breakfast Session’, ‘The Hospital Hour’ and ‘I’ll Pay That One’. Then there’s the network studios where live ABC Radio broadcasting emanated from 1960 till 2005. This is where most of the daily output came from, starting with the breakfast session and continuing into the night. Earl Reeve mused that he had a captive audience, as many of his keen followers of country music were those who were incarcerated, writing regularly with requests. Murray Jennings catered for the folk community, which was very strong at that time. The 6WF studio was large enough to accommodate bands, and on at least one occasion a dance group. Peter Harrison provided Jazz for the sophisticates, playing pristine vinyl recordings from his personal collection. Peter Newman kept the golden era of rock alive with his well researched and presented offerings. 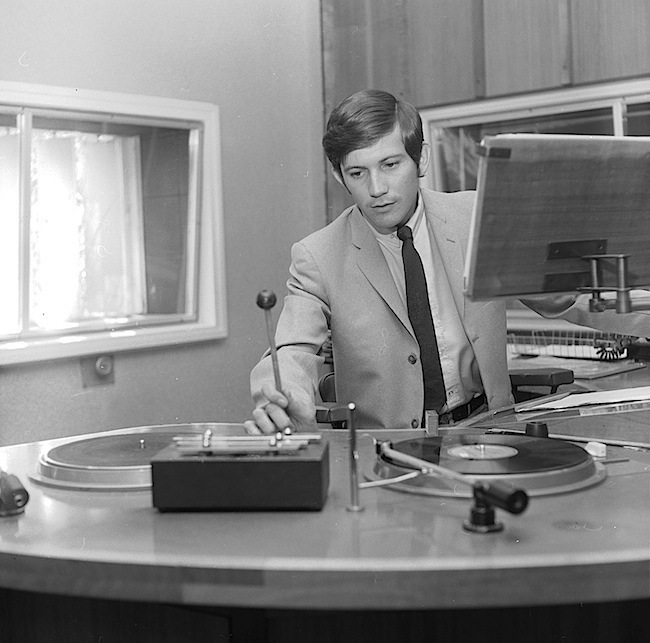 Each night was different, and they could do things no other radio station in Perth could, because of the remarkable facilities that existed at the former ABC site. Concerned veterans have been watching the lack of progress at this site, and anguish for its future. Will it become another white elephant, given over to esoteric pursuits, rather than it be a highly valued resource that continues to be used gainfully and enjoyed by the WA public at large? Or will it lose its character and become another extension of Perth’s cappuccino strips, disguising the glory it once enjoyed? As splendid as the performing arts institutions and academies are, most to some point depend on financial handouts. How glorious it would be if the era of grand local productions could find a renaissance through the profitable employment of this presently idle asset. This needs to be considered sooner rather than later, should there be a risk that parts will be whittled away for unrelated purposes. Once the valued infrastructure is gone, its unlikely to ever be rebuilt. 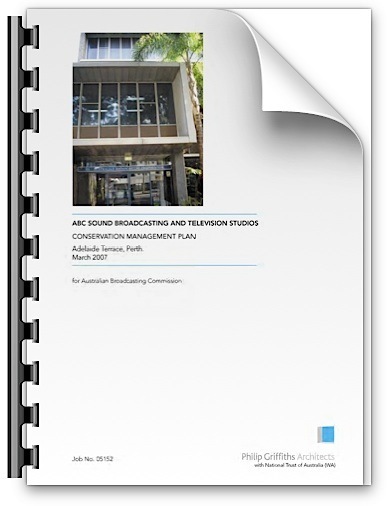 In January of 2012, a think tank of people connected to the electronic media was established to formulate a plan for the former ABC Radio studio site in Adelaide Terrace, Perth. A group of veteran and younger media players met to formulate a proposal on how best to utilise the former ABC Radio studios in Adelaide Terrace Perth for the future. 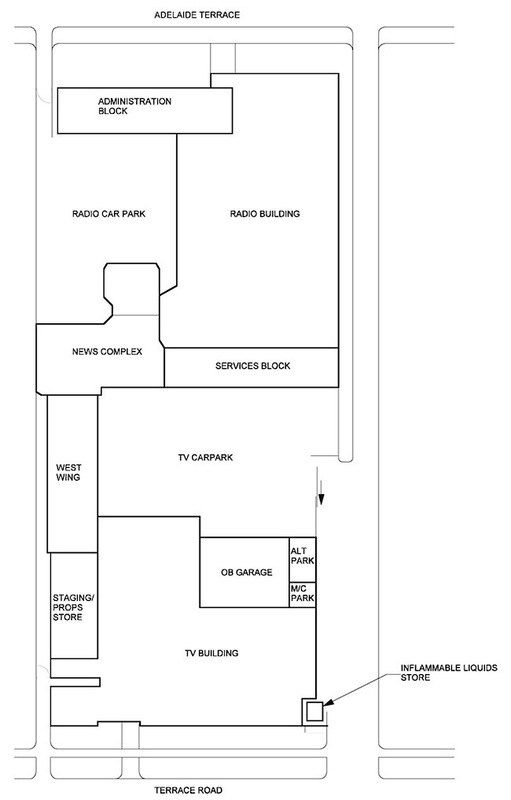 This is the floor plan for the ground floor of the Radio studios when the ABC was still using the site. 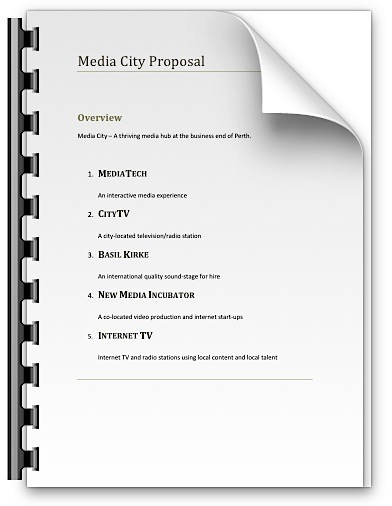 There was also a business plan submitted showing revenue streams and projections. The 1.28 hectare former ABC site on Adelaide Terrace has been vacant since the ABC moved to new facilities in East Perth in 2005, after 45 years broadcasting from the old site. The ABC commissioned a heritage assessment of their former site, which was completed by The National Trust of Australia (WA) in November 2005. 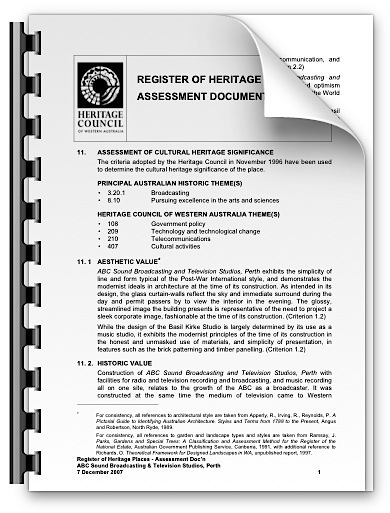 Following on from this, a Conservation Management Plan dated March 2007 was intended to guide the ABC, its professional advisers, the Commonwealth Department of the Environment and Water Resources, the Heritage Council of Western Australia, the future owners of the place and the City of Perth to assess the impact of proposed change on cultural heritage values and the conservation of the place. Interestingly, the office space in the Administration Building was given a higher heritage classification than the actual broadcast studios from which the vast majority of the output came. The currently unkept front garden, was also deemed more important than the broadcast studios. The ABC left behind working studio equipment, including the remaining original console dating back to 1960. One wonders if those who devised the heritage plan ever worked in broadcasting? 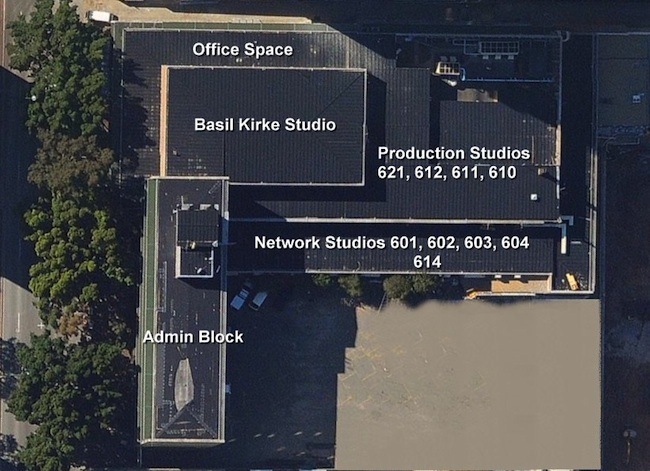 For they gave no importance to the preserved production studios needing a control room and associated air lock, except for the Basil Kirke Studio. If these studios were to find practical use for recording or rehearsal purposes, then sound isolation needs also to be preserved. Security is also a matter of concern, if anyone can gain unwarranted access when the facility is in use, and disrupt the proceedings. Since the ABC left, vandalism is an issue with much damage reported by former ABC staff who were lucky to get in. It seems that vagrants had little problem gaining access too, and their impact on the inside has been most undesirable. Smashed glass to the Basil Kirke control room, collapsed ceiling in the same control room, which should still contain the ABC orchestral audio mixing consoles. The side lane has been turned into a dirt track and is now only sand and gravel. This garden is dedicated to the memory of Mrs Kath French AM. 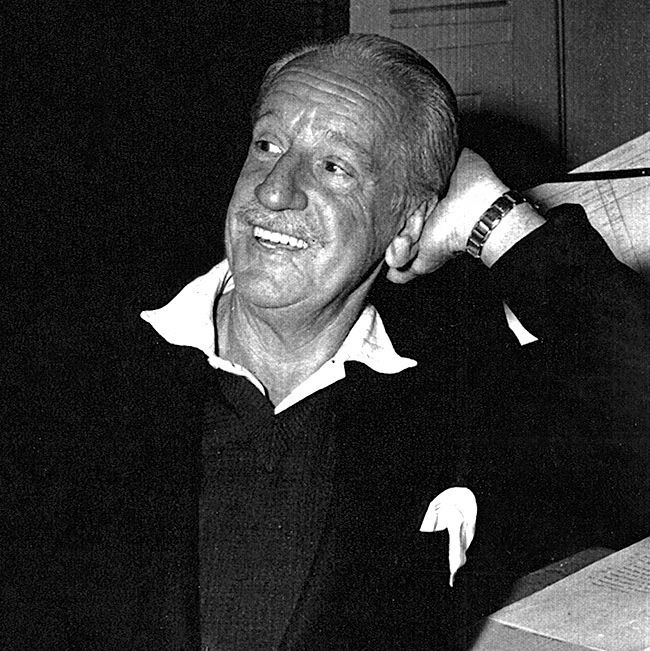 (1926 – 1994) A staunch supporter of the West Australian Symphony Orchestra and valued friend of the Corporation as Convenor of the ABC National Advisory Council. Most of her garden has now been obliterated, replaced by a temporary hut, and its difficult to recognise the plaque and its message. 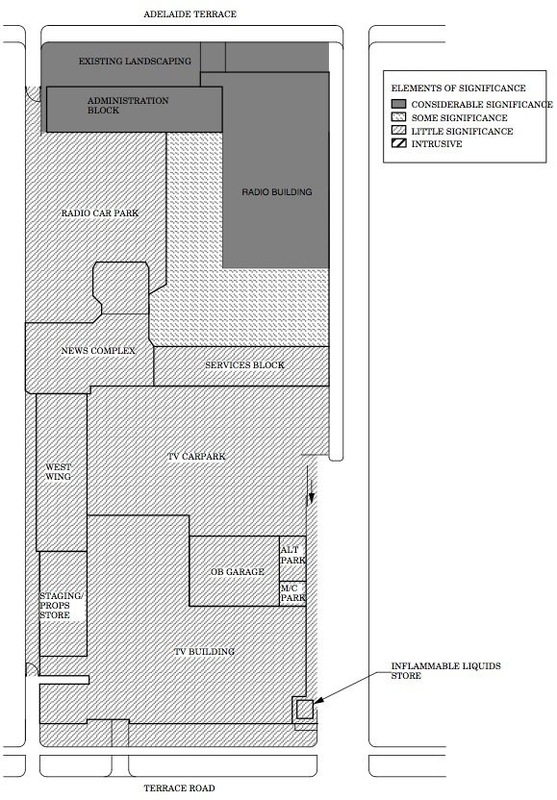 You’ll note in the above diagram that everything but the administration building, the production studio floors and the damaged Basil Kirke control room is deemed of little significance. One therefore assumes that the once vital broadcasting areas may be reshaped and put to some other use? Only the dark grey areas above are likely to be kept. If that is the case, then what will happen to the studio equipment left behind? The Quad studio audio mixer left in the television building was bulldozed along with the studio. Our video of the demolition shows the remnants of that in the rubble. We followed the demolition of the former ABW Channel 2 Television studios in Perth, Western Australia, which are making way for two new apartment buildings. This took place in late 2010 right through to early 2011. In 2006, the National Trust sought to purchase the former ABC site in order, among other things, to return the Western Australian Symphony Orchestra (WASO) to its former headquarters. This was thwarted when the Howard federal government let the Commonwealth property go to commercial tender. 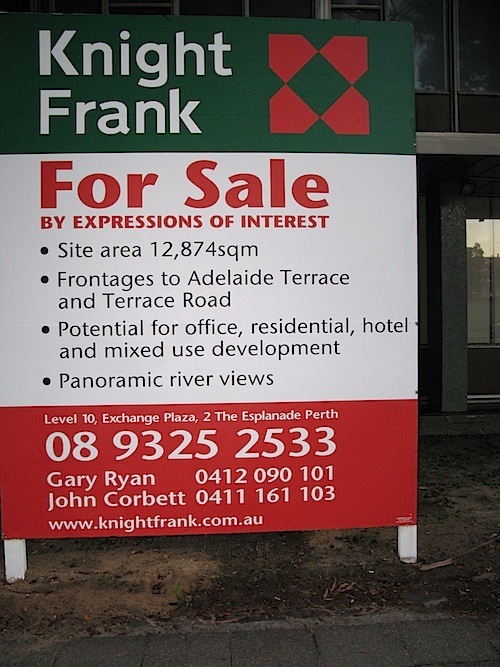 For Sale sign erected outside the Adelaide Terrace entrance to the former ABC site. In December of 2007, the Heritage Council of WA announced that it was placing the site on the State’s interim heritage register, a move supported by the City of Perth. The site was then placed on the State’s permanent heritage register in 2008. This aerial photo gives an indication how vast the former ABC site was. This aerial photo identifies the various buildings that covered the whole site. The main radio buildings are identified in this aerial view. 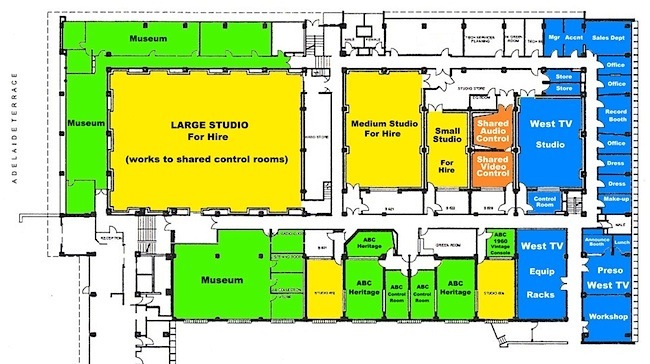 The studio designations changed from 1960 to 2005. The ones given here are the original studio names. 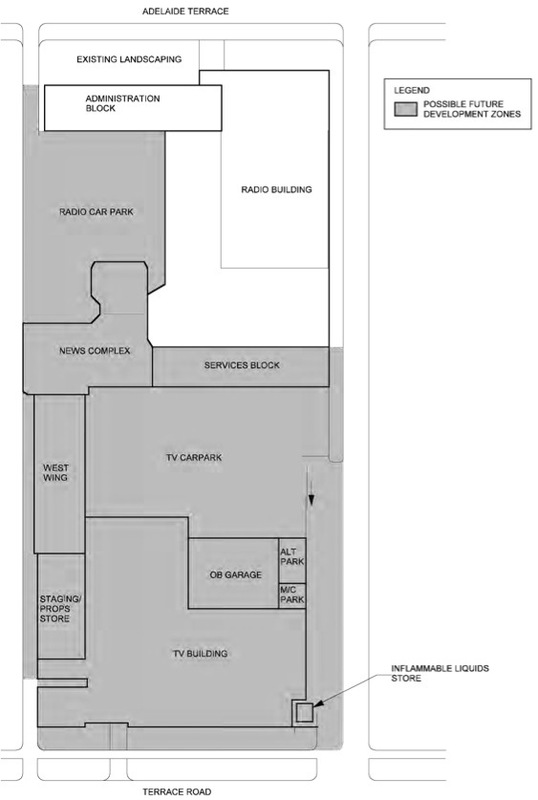 This floor plan highlights the studios within the Radio building. The larger ones were used predominantly for program making, rather than continuos live broadcasting. The smaller studios were live program sources used to network metropolitan and regional programs to the listeners. This is where the announcers would present the many popular programs involving recorded music and talks. The 6WF-720 and 6WN-RN studios were busy most of the time, before technology allowed networking from the eastern states without human intervention. This was enabled by better east to west program lines and satellite links and digital delay machines to time shift the programs. 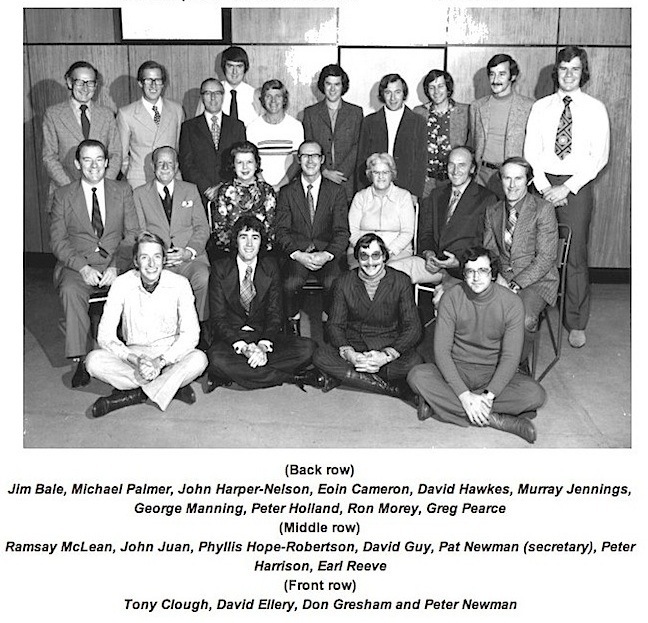 These studios were also used for news bulletins until a separate News and Current Affairs building was erected. In 2008, despite the National Trust of Australia (WA) and the Western Australian Symphony Orchestra seeking to buy the property, it was sold to Ventrade, a Perth-based subsidiary of Singapore company Chuan Hup Holdings, for $37.58 million. 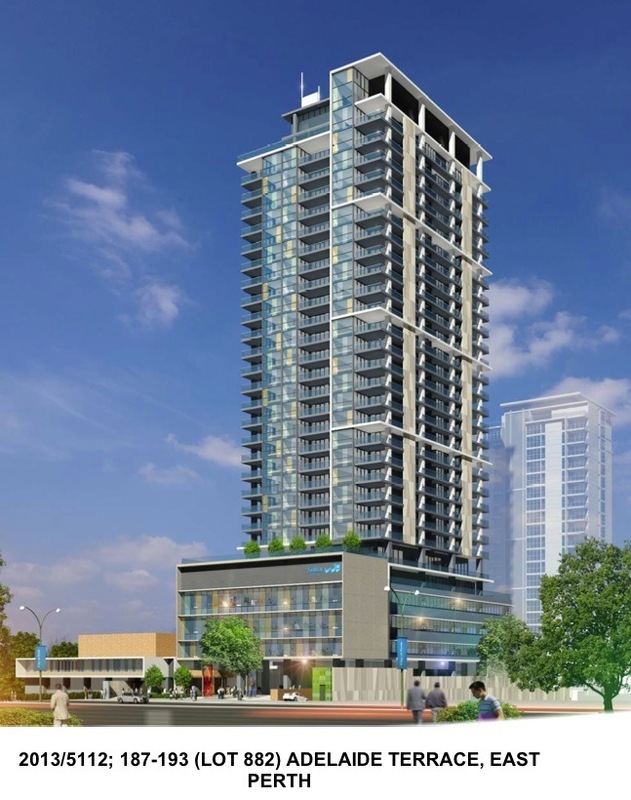 Ventrade entered a joint venture with local builder Finbar, to erect high rise apartments on the site. 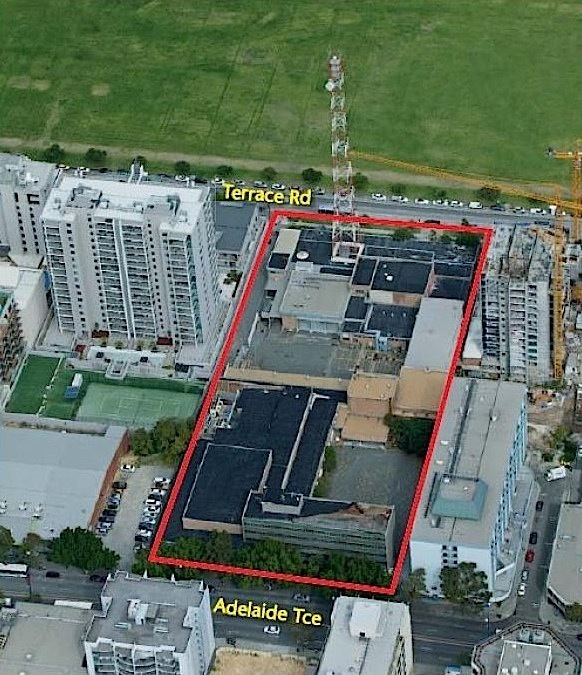 A Heritage Agreement was negotiated between the Heritage Council of Western Australia and Finbar Group Limited, which was signed and finalised prior to the issue of the building licence. 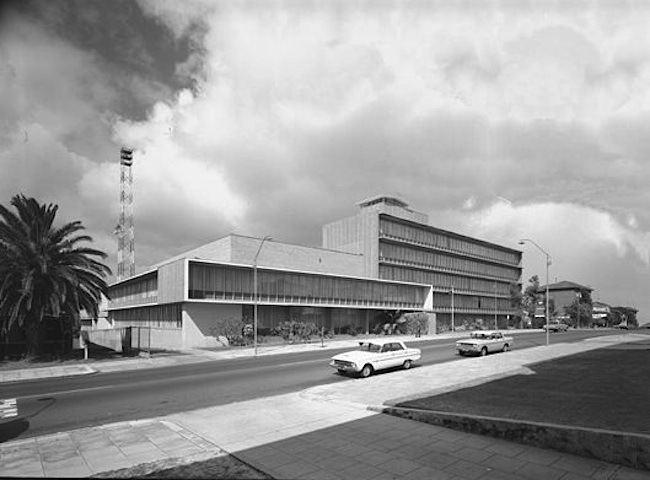 This was designed to preserve the ABC Radio building and Administration Building, whilst the TV studios were demolished. 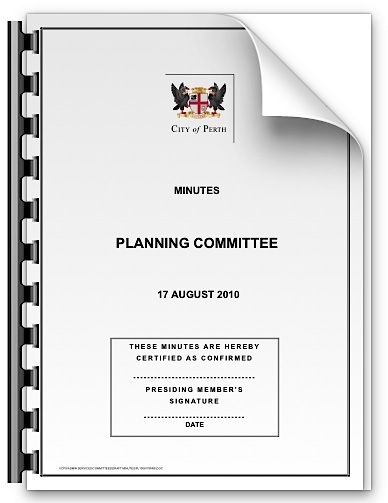 In 2009 a request was submitted to the Council to initiate an amendment to the City Planning Scheme No. 2 (Amendment No. 20) to create a Special Control Area over the former ABC site to facilitate the redevelopment and future subdivision of the site. All land that the City of Perth is responsible for is subject to the City of Perth City Planning Scheme No 2. 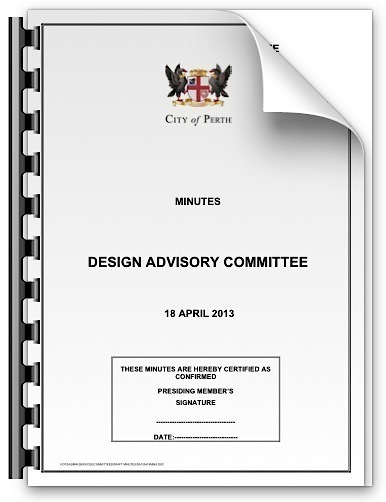 At its meeting held on 30 March 2010, the Perth City Council, resolved to adopt Amendment No. 20 which received Ministerial Approval and was gazetted on Friday, 6 August 2010. Finbar’s original concept drawing for the heritage listed former ABC Radio and Administrative buildings site. The City of Perth, at its meeting held on 24 August 2010, approved the staged redevelopment of the southern portion of the site, with Stages 1 and 2 including three, four storey mixed-use buildings and two residential towers of 24 and 22 stories containing 160 residential apartments. Our group then submitted a costed business plan to the developer in 2012, which related to the proposed future use of the Radio studios. This was done after much consultation with the broadcasting, recording, internet and hospitality industries. Our plan was to keep the facilities for activities sympathetic to the original design and purpose of the Radio building. That being the production and broadcast of local programs. 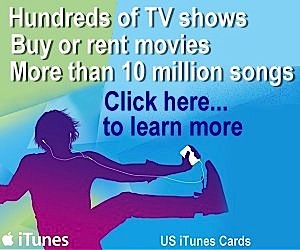 Broadcast over community television and through internet streaming. This would involve new and old media, and include new content forms such as computer gaming. We considered it important that the proposal be viable and self supporting, rather than a constant drain on public funds. This would be achieved by applying an industry business model that would embrace broadcasting, recording, web activities, streaming internet and studio hire. There would also be educational, history telling, tours, live demonstrations and opportunities for software development of an entertainment nature. 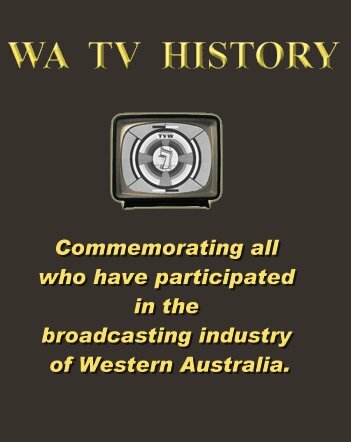 To add to the heritage nature of the site, it was planned for there to be a significant museum included to not only exhibit Radio and Television equipment over the years, but also illustrate the history of not only the site, but also telecommunications, broadcasting and moving pictures in WA. The educational element would include hands-on activities to stimulate young minds. 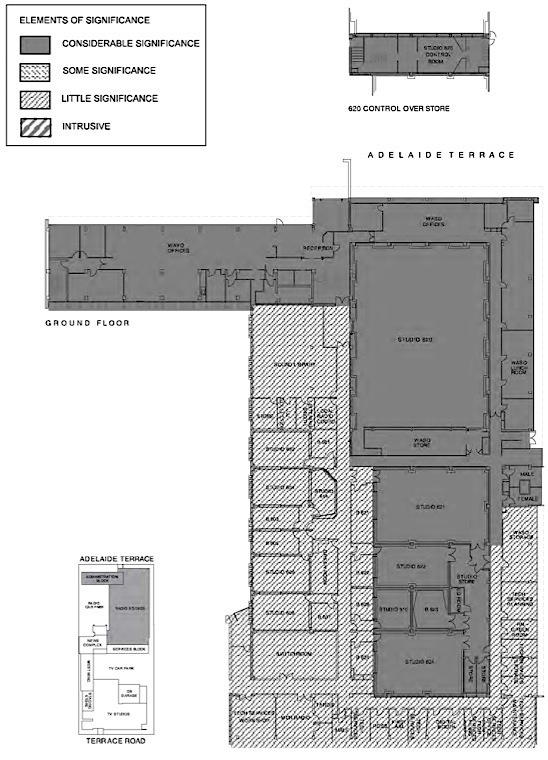 Finbar’s application for Stage 3 involves redeveloping the Adelaide Terrace property in question. 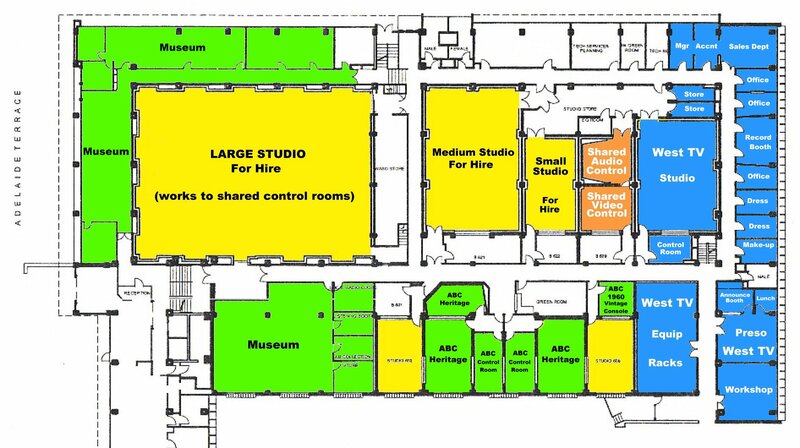 This site currently contains the remaining ABC administration and studio facilities which are subject to the Heritage Agreement. Approval was sought by Finbar in April 2013, for the construction of a 36 level mixed-use development containing 157 dwellings, three office levels, a café / bar, dining court, entertainment space, and 400 car parking bays, of which 18 bays would be retained for the ABC studios portion. The Ground level they proposed, would include a landscaped forecourt to Adelaide Terrace, Café / Wine bar, commercial and residential lobbies, and 11 food tenancies forming a food court, related seating and a performance stage / entertainment space (to be know as the ABC Commissary). 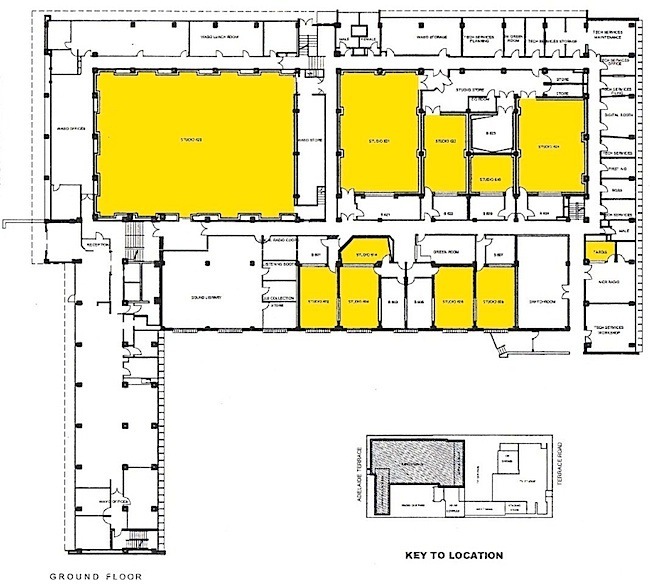 An open-sided gallery, or walkway, was proposed as an interface with the retained ABC Studios. It is assumed that this walkway would be achieved by demolishing the five broadcast studios facing west, retaining only the four production studios facing east? It would also demolish the old record library area, computer-floored former equipment room known as the Switchroom, and the former Master Control and its associated studio. 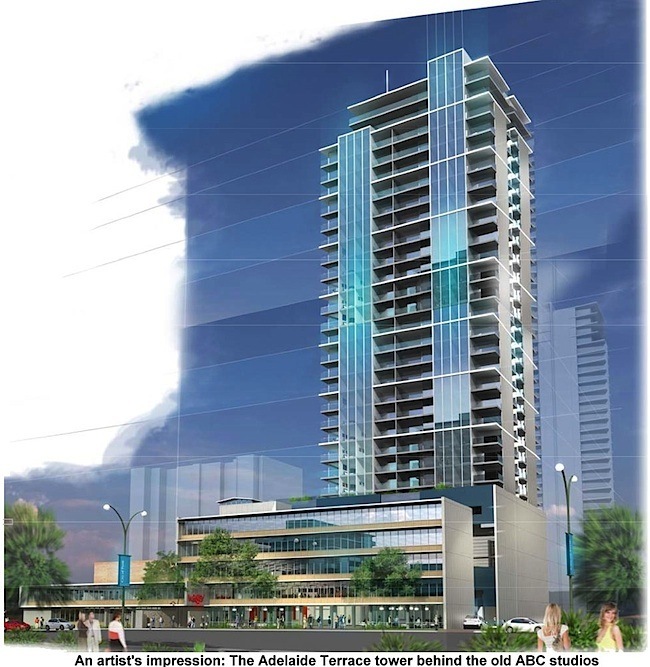 In addition, Finbar also proposed to demolish the former ABC Administration Building, to make way for their new mixed-use development. This would break the Heritage Agreement they had earlier signed. Finbars modified concept that did not gain approval. Finbar proposed retaining the ‘Basil Kirke’ studio as a recording, rehearsal and performance studio, restored in accordance with the requirements of the Heritage Agreement. But in doing this, the other half of the Radio building would be demolished, taking with it much infrastructure that would be useful under our concept. 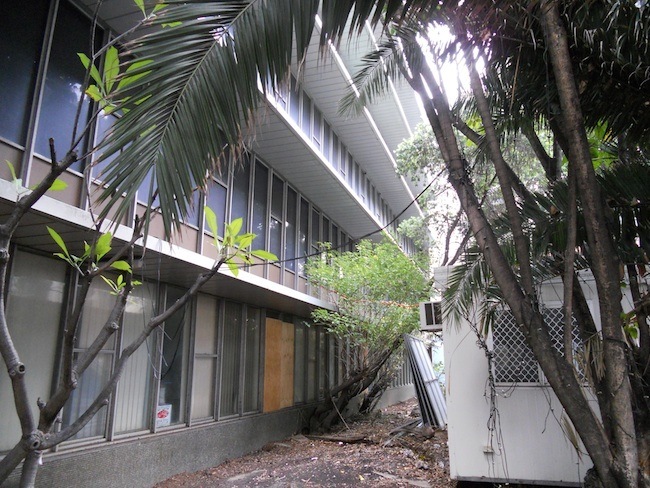 They then proposed gifting what remained of the ABC building to the National Trust or similar community organisation, and subdivide off the land on which the building remnants stand. 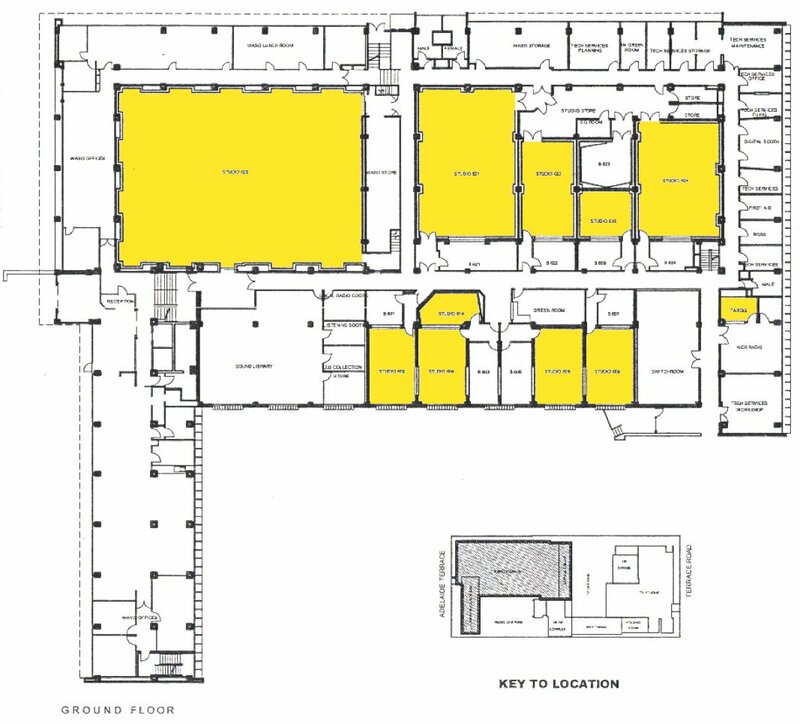 By knocking out vital infrastructure, computer floors, equipment space, cable ducts, control rooms and technical areas, our proposal of making it a home for the community television station West TV would be thwarted. West TV had indicated they would be a potential rent payer, adding to the viability of our submission. We proposed running the site along commercial lines, to make it self sufficient, whilst still making it a venue for cash strapped performers and orchestras. We are keen to return local production to WA, where we have first class performing arts academies, but less scope for employment unless they move interstate or overseas. We wish to reverse that trend. We don’t see the point of demolishing part of a perfectly good building and facilities just to provide a walkway through a heritage listed property, removing everything in its wake. Needless to say, much of their proposed demolition of heritage property will now need a rethink, since their submission was rejected, as detailed in the City of Perth Design Advisory Committee minutes of 18th April 2013. The question is, how much has already gone in expectation of this happening? We as people familiar with the building, are no longer privy to whats happening inside the building. The following video shows what the building was like in 2005. We wonder how much still remains? This is a tour in 2005 of the former ABC Radio and TV Studios in Perth, Western Australia, which were used for broadcasting from 1960 until 2005. Finbar estimate the value of gifting the facility to The National Trust is worth $8,000,000. One will expect this to have some taxation benefits? The remaining four studios would then be set aside in perpetuity for community purposes, thereby conserving some of the original functions. That would leave four studios of varying sizes to either need subsidy, or function as a self sustaining operation. We think our proposal involved much more scope for commercial success, than the gutted facility that seems to be envisaged. We have seen the Telecommunication Museum stripped from Wireless Hill, the Fremantle History Museum, the Light and Sound Discovery Centre, and the Fremantle Vintage Car Museum all sent packing. The former ABC building is an ideal purpose built location to provide Perth with not only a top tourist attraction, provide employment opportunities locally for the performing arts, revitalise local television production in WA, foster education of old and new media, set up an incubator for new telecommunication technology, and inject life back into a heritage building, whilst using it as it was designed. We propose to return the site to a bustling hive of activity, with a wide range of activities bubbling away in every available space of the old radio building. Even utilising the former ABC canteen area as a food, drink and social venue, not only for production staff and visitors, but also a meeting place for industry veterans to associate with old friends and colleagues, as well as provide an opportunity to mentor younger participants who are entering the field. Unfortunately, what seems obvious to us may be missed in the decision making process, if real estate priorities inhibit us from injecting life back into every square of the heritage listed building, rather than chip away at the structure and make our most meritorious plan unworkable. Maybe if the Howard government (in office from 11th March 1996 to 3rd December 2007) had more empathy towards WA heritage earlier in this decade, and the WASO had been allowed to return to its old home, then this situation could have had a totally different outcome. It would be interesting to learn what support there is for our proposal in the wider community? Should there be apathy on this issue, then the decision makers may assume that no one cares and that they should let the developer do what they wish. Verity James returns to the location where she was once a news reader for ABC Television. Today it’s now the Adagio Apartments. 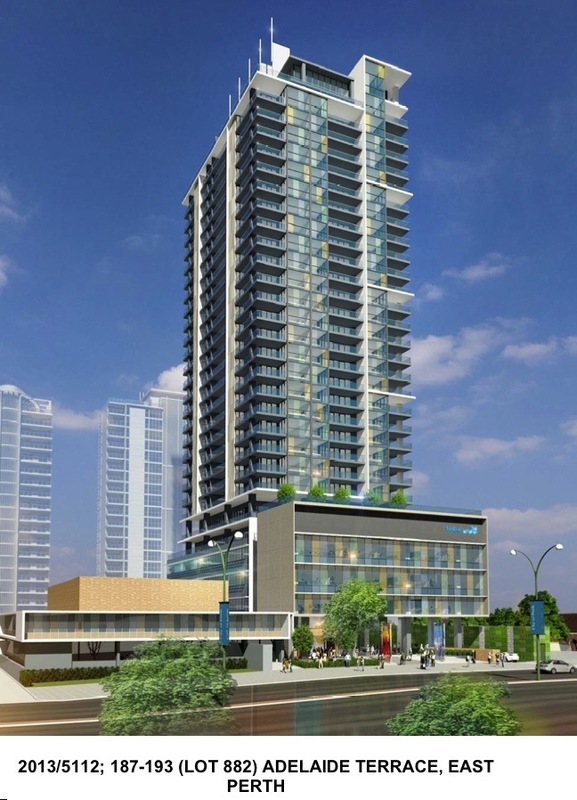 There’s 23 storeys of 2 and 3 bedroom luxury apartments as well as a sub-penthouse and penthouse. The facilities include a theatrette, pool with BBQ area, spa, sauna, gym, games room, residents lounge, function and meeting rooms. The end of Local TV… or is it? Background to the ABC leaving its former Perth studio site. My heart sank when I looked at the images remembering the good times when I worked in these studios but seeing the familiar faces again was uplifting to say the least. My time with ABC radio and television helped me build a career in broadcasting culminating in being recognised for my services by the Queen. I couldn’t have done it without the discipline and encouragement received within these hallowed halls. The building has an aura even in its dilapidated state and an aura that will endure into its new life. Wonderful record of the history of the ABC in Perth, this is the station that made living in isolation in W.A. from the rest of the country a pleasure.